Well, let's do this then shall we? 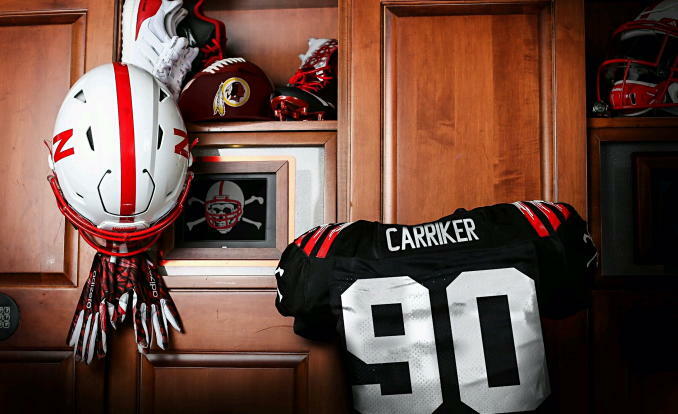 Welcome, everybody, to the Carriker Chronicles, the people's show! And I have a special co-host with me today. What is your name? Adam: "Are you excited to be on the show?" All right let's get right into it shall we? Right off the bat I want to send out a congratulations to Ameer Abdullah. Some breaking now Bob Quinn, the general manager of the Detroit Lions has announced that Ameer is the starting running back for Detroit coming into this season. When he was asked why he drafted no running backs he said because I have all the confidence in the world in Ameer as our starter. So shout out and congratulations to Ameer Abdullah. Big congratulations to Nate Gerry as well. He was drafted by the Eagles in the fifth round he was 184th overall selection. He's listed as a linebacker he's 6'2" 218 pounds as of right now but I think some people have forgotten he came to Nebraska as a linebacker. Adam: How do you feel about Nate Gerry playing with the Eagles as linebacker? Adam: I like it. I like it! Go Big Red is great! Fly Eagles Fly, right? He (Gerry) was a linebacker when he came to Nebraska. And then, he was a track guy in high school as well so he moved back to the safety position his sophomore year. This guy's physical obviously he loves the weight room. He puts on 12 pounds he could easily be 230. He could easily be an outside linebacker. As a sophomore he was second on the team in tackles. As a junior he led the team in tackles. As a senior he was second on the team in tackles again. The guy is a tackling machine. He's physical he's big not afraid to hit people. Congrats, he's going to do some good there in Philadelphia. He was the only player drafted this year and I'm going to get into a little bit more but that's not an indictment on Riley and his recruiting. It actually helps his case when you talk about the lack of talent that he's had to deal with the first couple years. But before we get into that I want to talk about several Husker draft stats that I found rather interesting. Adam: You want to get us some Husker draft stats? Adam: I love it. Go Big Red. Can you say go Nebraska? Adam: Go Big Braska! That's even better, the combination. The first thing heading into this draft here are some interesting things about Nebraska. Nebraska was tied for the second most defensive lineman drafted history. Nebraska--at the time, now we're sixth, we dropped a spot. We were fifth all-time in most NFL draft picks coming into the draft this year. Nebraska does have the most running backs drafted in history. #runningbacku And the fourth interesting fact that have is Nebraska is one of only five schools with a player drafted every year since 1967. We've had a player drafted every year since 1962 and coming into this draft we were the only school with multiple players drafted every year since 1963. Now unfortunately that 54 year streak was broken but I'd say that's a pretty good run. Would you say that's a pretty good run Trinity? Trinity: a pretty good run! Adam: That was a pretty good run she says. Now here's some interesting general facts about the draft in general per optimistic Husker on Twitter. You got to give that guy a shout out! Big-time Husker fan. 31.5% of first round picks or 5 star rated coming out of high school. 68.75% of first round picks this year were four-stars or higher coming out of high school. That means 22 of the 32 first-round draft picks this year were four star rated or higher coming out of high school and that's where I talk about Coach Riley and the talent he's had to deal with. Some people have been coming down on him like it's an indictment of him of players not getting drafted this year. He's only been here for two years! When you come out of high school you have to be out of high school for three years before you can even declare for the NFL draft so the players he's recruiting aren't even eligible to be in the draft just yet. So it's not an indictment on Riley he is getting the recruitment headed in the right direction for the Husker I'll address at his second. But here is something that I don't know it's not all that exciting for the Huskers for Husker Nation but it's interesting in my opinion. Since 2003 I had a friend text this to me I'm going to read it since 2003 Iowa has produced 16 NFL draft picks on offensive line. Nebraska has produced nine. Of Iowa's 16 picks two were first rounders and two were second-rounders. Nebraska hasn't had a lineman taken before the third round since 2002 Richie Incognito and Spencer Long were both third rounders when they were drafted. From 08 to 2013 the Huskers signed 21 offensive lineman. Not one of those guys was drafted. To be fair there are several Husker linemen in the NFL that are contributing as starters or otherwise to some NFL teams to be completely Fair on that point. Since 2007 Wisconsin has put 5 first round offensive linemen into the into the league since 2003 Wisconsin has had 14 offensive lineman drafted and three second-rounders to go with those five first-rounders. So not the most exhilarating thing in the world for Husker fans but kind of interesting. But this is something to get excited about and this is what I was talking about earlier with Riley turning around the recruiting. As of right now the Huskers have the 9th ranked recruiting class in the country for 2018. A lot of those recruits including Bookie and some of the other guys that are coming in are bringing guys with them they just haven't been announced yet. But more guys are coming that's even more exciting and I hope some of them are offensive linemen. Adam: How do you feel about that Trinity? Adam: I love it! Here is something that I thought was interesting. My wife sent me. I don't follow Tom Brady on Instagram. I'd rather knock him down than follow him but my wife sent me this and it was rather interesting. It was something that he put on his Instagram so I'm just going to read directly from it. It says Tom Brady #199 + 232 plus 5 undrafted in the huddle equals 51 Super Bowl. So basically he was drafted 199th overall another guy in the offensive huddle was it 232 second pick in 5 other guys so 7 of the 11 guys in their offensive huddle either went undrafted or were late round some pics and that led to the Superbowl 51 Championship so there's something you can't measure. You can't measure a guy's heart. So I want to give a congrats to all the former Huskers who found new homes in the NFL this past weekend. Congratulations go out there! Good luck prove the doubters wrong and prove your supporters right. Now some other news broke earlier this weekend and that was Randy Gregory failed his 7th drug test. Now I didn't know you could still be in the NFL if you fail that many drug tests. He was already serving a one-year suspension and his career could be over. I did speak with Randy. He told me there's much more to the story that people don't know. He did not share with me. He talked about possibly coming on the Chronicles at some later date talking about it and sharing the full story just to kind of educate people on everything that's going on. He was a top 10 top five talent pick-wise. (He was) going to go early first round, he fell to the second round to the Cowboys. Hasn't played a whole lot he's got my number my phone is always on but more importantly there's some things in life that are more important than football like life itself so I'm hoping he just gets everything turned around for life going forward and then address football once that's all taken care of if that's still a possibility for him. Now ... John Harbaugh. I was a big fan I got the opportunity know him when I was in the NFL. I was a big fan of him. Jim Harbaugh's brother (Adam shrugs his large shoulders). I don't know, dude seems kind of crazy never got to know him but john had a great tribute to Sam Foltz during the draft on the NFL Network and some of the words he said were: Sam would have been drafted this year. He was one of the absolute best specialists in the entire country and I thought that was really really cool of John to say that about Sam and obviously pretty true. I did forget to mention this earlier in the show. There are other guys found NFL homes so let me address those right now. Former Huskers linebacker Josh Banderas led the team with 93 tackles last year signed as an undrafted free agent with the Broncos. Running back Terrell Newby with the Minnesota Vikings. Wide receiver I think he's going to play wide receiver I don't know maybe we'll do some Wildcat with him? Tommy Armstrong is with the Minnesota Vikings. Brandon Reilly wide receiver with the Buffalo Bills. Wide receiver Alonzo Moore, former Husker wide receiver with the Kansas City Chiefs. Offensive lineman Dylan Utter I believe is getting a tryout with the Vikings. Tight end Cethan Carter is an undrafted free agent signed with the Cincinnati Bengals. Jordan Westerkamp has a tryout with the Bucs and I think he's got a really good chance to get signed there. We'll see what happens the dude can just ball. I would love to see him in New England. He is what Welker used to be, he is what Danny Amendola is. Adam to Trinity: How do you feel about Jordan Westerkamp? Adam: Go Big Red! Go Nebraska? Trinity: To throw the bones! SPECIAL BLOOPER REEL! Be sure to check out the blooper reel of Trinity and Adam as they share some quick outtakes from today's show. Here is the transcript of that blooper. For the full effect, be sure to check out the video. Well let's do this then shall we? Welcome everybody to the Carriker Chronicles the people show! And I have a special co-host with me today. What is your name? Trinity: (pauses, then puts palms up and whispers to Adam "what am I supposed to say?" As Adam is breaking down with laughter, she says into the microphone "Go Big Red!" Trinity: (she's along at the microphone in the studio, no Adam in sight. Trinity pounds her fists on the table) Dad, we're starting the show now! GET IN HERE NOW!! !